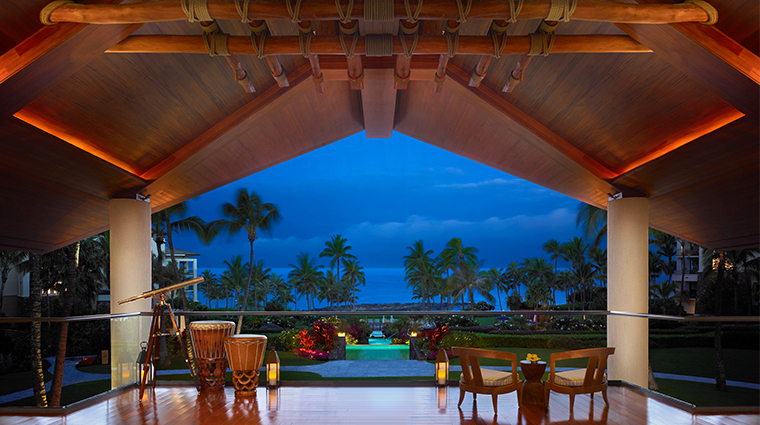 Nestled along Maui's coast in one of the most exclusive oceanfront areas on the northwest side of the island, the 24-acre Montage Kapalua Bay is ensconced in nature. It’s part of Kapalua Resort, a 22,000-acre paradise that began as a successful pineapple plantation and gave way to a resort development under the vision of Colin Cameron, a fifth-generation descendant. Harmony with nature is a natural component of the resort and region. Behind Montage Kapalua Bay resides the Puu Kukui Watershed Preserve, more than 8,000 protected acres managed by the Nature Conservancy. Flanking the hotel are two award-winning championship golf courses, The Bay Course and The Plantation Course, both recognized certified Audubon sanctuaries. And of course, the white-sand bays fronting the area are marine reserves where you can swim and snorkel. 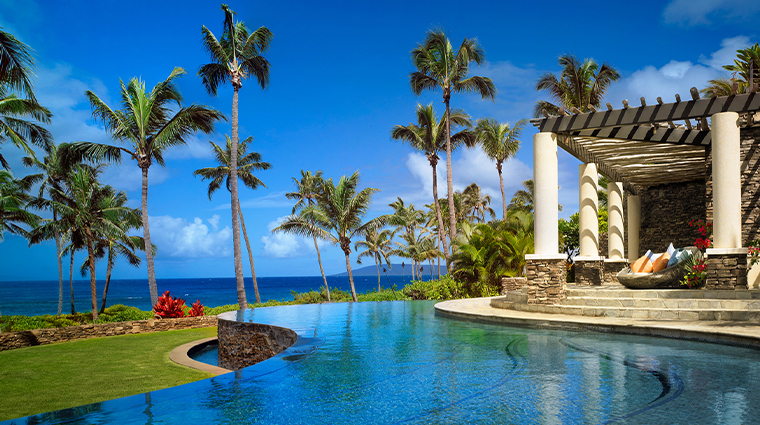 The Kapalua resort's Spa Montage is 30,000 square feet of indoor-outdoor luxury. The Hawaiian philosophy of ahupuaa — Mother Nature's cycle from mountain to sea — is embraced in whole-body therapy and rituals. The Maui hotel's fitness room has circuit training, Kinesis equipment, free weights and cardio machines. The ocean-view movement studio hosts various classes (Yogalates to Boot Camp), and personal trainers are available. Kapalua is a quiet, upscale area. Championship golf courses, well-kept hiking trails, zip lines and nature reserves are part of the immediate surroundings. To learn more about local traditions, sign up for the enriching program from Cultural Ambassador Silla Kaina that offers native lessons in the arts of hula, lei making, ukulele, and storytelling. For a luxurious and intimate affair, throw a catered party for up to 16 at the exclusive oceanfront Cliff House. Don’t worry about doing any chores in your spacious residence; housekeeping drops by twice a day to spruce up kitchens and refresh rooms. You don’t need to leave the confines of your suite for dining. Visit Montage's Mahana Market to pick up various local and gourmet groceries (it also sells grab-and-go items, coffee, organic food, ice cream, and wines and spirits) to enjoy in your residence. The salon at Spa Montage provides hair and nail services with a view of the water, and men can visit the barbershop for a straight-razor shave (or a beard/mustache trim) from a master barber. The premier all-suite resort boasts 50 residences and six grand residences, ranging from 1,250 to 4,055 square feet. Living areas come with state-of-the-art technology (including flat-screens, DVD players and Wi-Fi) along with pullout sofas, and expansive private lanais (or “balconies”) are adorned with extravagant day beds overlooking gardens and the ocean. Earth tones and wood fill the contemporary rooms, though some blue accents are mixed in for some beachy inspiration. The walls are appointed with hand-painted original local art. We recommend breakfast and dinner at the stunning Cane & Canoe, led by executive chef Chris Damskey. The sleek wood-paneled dining room is the perfect place to indulge in succulent steaks and island-inspired seafood dishes like Ora King salmon sashimi, Kauai prawns with ginger or Keahole lobster pot pie. For more casual fare, head for The Hideaway. Bites like coconut shrimp satay and a seared ahi cobb salad hit the spot, but the highlight is the creative cocktail menu featuring signatures like the Bee Keeper (gin, absinthe, honey and lemon) and the Awesome Blossom (vodka, hibiscus-orange shrub, lime and ginger beer). 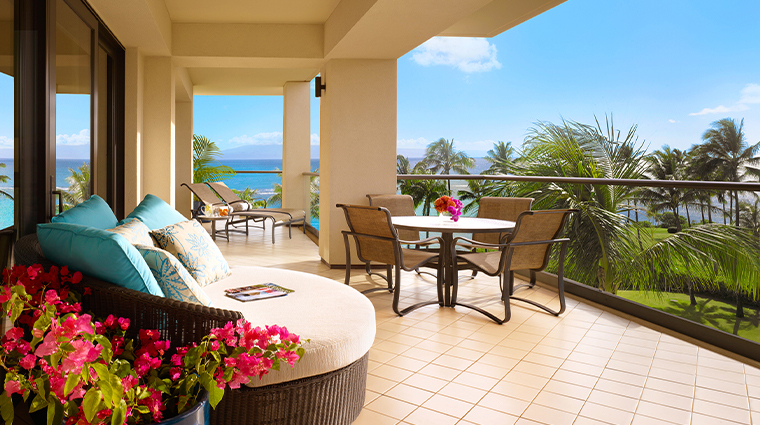 Head to the luxury hotel’s poolside Sunset Patio, Hana Hou Bar or Beach Club for lunch. As you nosh on grilled fish tacos with chipotle aioli and black bean corn salsa, take in the tropical foliage or sit in one of the private nooks.